From the origins of the universe to exploring future energy needs, via eating lunch with Nobel Prize winners and venturing deep inside tunnels below London, teacher study visits can open new doors, which ultimately improves learners’ experiences back in the classroom. Teachers spending time out of the classroom can have a greater impact on the teaching of STEM subjects than taking students out. Teachers can enhance their understanding of their own subject area, and pick up new content to use in teaching, making it far more relevant and engaging for students. Schemes of learning can be infused with this rich context to support other teachers, so the benefits of the visit or placement can spread to colleagues and across the whole school. As real-life STEM areas are not the narrow silos that we teach within schools, effective cross-curricular work can often be a successful outcome of a teacher visit to companies, research institutions and other environments. Teachers are often the main source of careers advice for their students. Having experience of real-world contexts, including routes into employment, can support teachers to give effective career advice. Embedding real experiences into the curriculum is essential to help more students see STEM subjects and careers as something for them. CERN, the world-famous particle physics laboratory, is renowned for its research into particles. The Large Hadron Collider (LHC), which is just part of a large accelerator complex sends particles flying around a circuit buried under the border between France and Switzerland. While the study of novel particles that comprise the standard model may not seem to be something that would interest all but die-hard physics fans, teachers who come on the UK Teacher Programme visits to CERN find out that there is far more than nerdy physicists working out equations on blackboards. CERN is a large engineering complex, which doesn’t actually employ many physicists. Most people working there are engineers of all types: computer scientists, material chemists, and a whole host of associated trades to support this massive endeavour. The teacher visits last four days and immerse teachers in the wider world of CERN and its implications for real-life impact, including: being the home of the world wide web, creating radionuclides for medical use, and hadron therapy – the latest approach to targeting difficult-to-reach cancers. This multi-displinary approach also lends itself to the most well-known parts of CERN – teachers go through parts of the accelerator complex and end up 100 metres underground at the LHC and its associated detectors. Here, high energy particles (protons and/or lead ions) are smashed into each other at high energies. New particles then emerge, however briefly, from this soup. This helps give an understanding of what happened during the big bang and the moments in the immediate aftermath. Visits to the “Anti-matter factory” look at how anti-matter is being produced and trapped for experiments; and exploring the oddity that if matter and anti-matter were created in equal amounts in the big bang, where has all the anti-matter gone (or why are we still here)? Evening discussions over good Swiss fondue help cement the understanding of the participants – while lunchtimes can often involve sitting next to prominent scientists and engineers – including a number of Nobel laureates. Fortunately, selfies are encouraged, so teachers go back buoyed up and even more enthusiastic about big science and engineering. 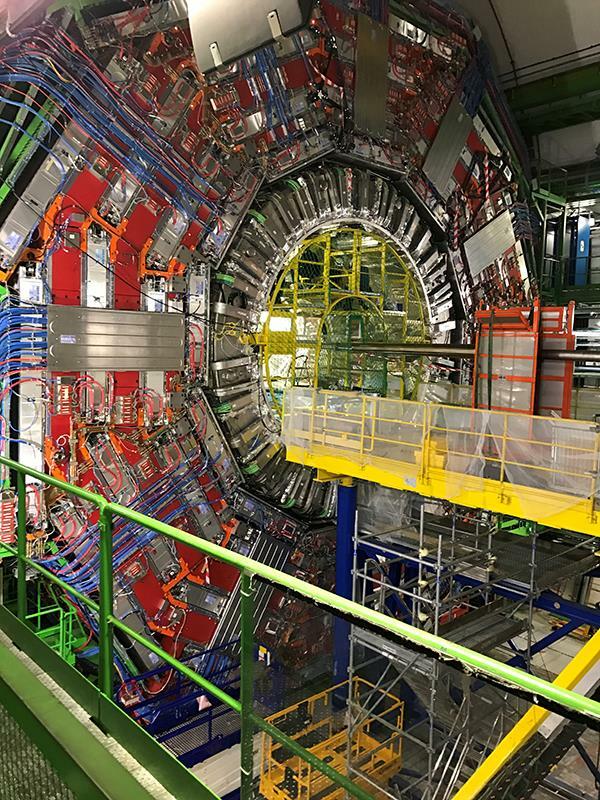 Other puzzles are explored at CERN, to which teachers are first-hand observers, giving them experiences that they can take back to their teaching. In fact, many produce videos or even Skype their own groups while on a visit. From just one trip to CERN, involving 78 teachers, we found that more than 11,000 students had been taught directly with contexts from CERN – and not just in physics, 45 per cent were in maths, biology, chemistry, engineering and computing lessons. This knowledge spreads. Through these teachers’ colleagues, a further 11,490 students had experience of CERN via context embedded within their lessons, within just three months of the visit to CERN. For 75 per cent of teachers, the visit to CERN also enabled links with parents and the wider community, while the information from the visit prompted greater awareness of careers with 79 per cent of students. Teacher visits to this fascinating country yield a huge amount of relevant context for students. How can you use the energy of the Earth of give useful power for houses and industry? Why is the Earth’s magnetic field so important to life? And how does it produce the amazing Northern Lights? Perhaps most importantly, how do you grow tomatoes in a fairly barren and cold landscape (and make possibly the best tomato soup from it)? The impact from gathering first-hand experiences to relate in the classroom are highly important – especially if students have a hand in helping a teacher plan for what they want to find out from a visit. Crossrail is an ambitious engineering project to deliver increased transport capacity within London. As part of the STEM Insight programme, teachers spend two-weeks on a placement in this unique project. This is not just a single on-site visit, but a deep immersion within the organisations behind Crossrail. This gives a huge insight, not just into the STEM aspects of project, but most importantly, the career routes that are available. With many teachers going from university straight into teaching, possibly via one or two other jobs, most are not exposed to the huge range of careers and routes available, such as modern Apprenticeships and work-based learning paths. Industry is crying out for people to enter the STEM sector, yet for many students their idea of what careers are available is fairly limited – often to doctor, teacher, nurse and “scientist”. As teachers of STEM subjects are the experts in their field, they are usually the main source of careers advice for young people – but teachers need more support. Having a placement supports teachers with experiencing a wide range of possible job routes; spending time with the human resources section of a company can then allow teachers then to give students more focused job application advice and also learn how to prepare students better for interviews. A very important part of any teacher CPD is action planning for impact within their schools. Just a visit on its own will only have limited effect, whereas a definitive impact process will help teachers with planning, implementing and evaluating their CPD. Teacher visits should include a follow-up activity, where teachers who have participated can share their impact, resources and experiences to help further embed good practice across all their schools and colleges.